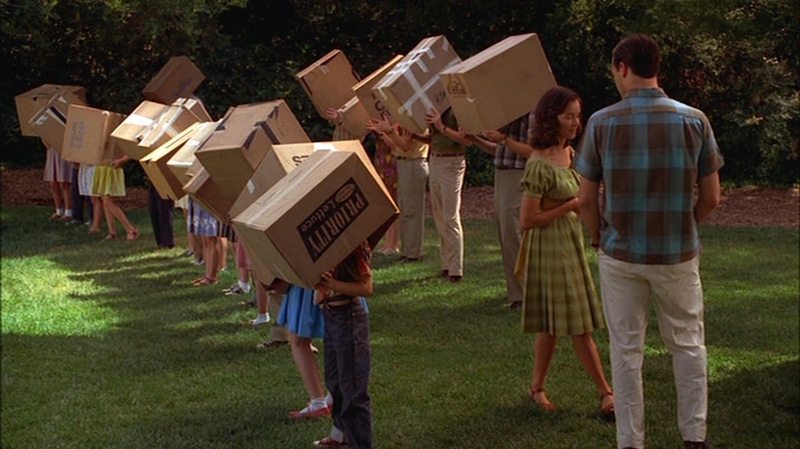 In all of the excitement of the total solar eclipse crossing the U.S. yesterday, I had almost forgotten about this brief scene in Mad Men‘s third season when Don and Carlton accompany their kids to build camera obscuras to view the solar eclipse of July 20, 1963 with their idealistic new teacher, Suzanne Farrell (Abigail Spencer). Suzanne: So you’re different, huh? Suzanne: You’re all wearing the same shirt. Don smirks. She got him there. Indeed, Suzanne has a point about the sartorial uniformity of Westchester County’s dads. 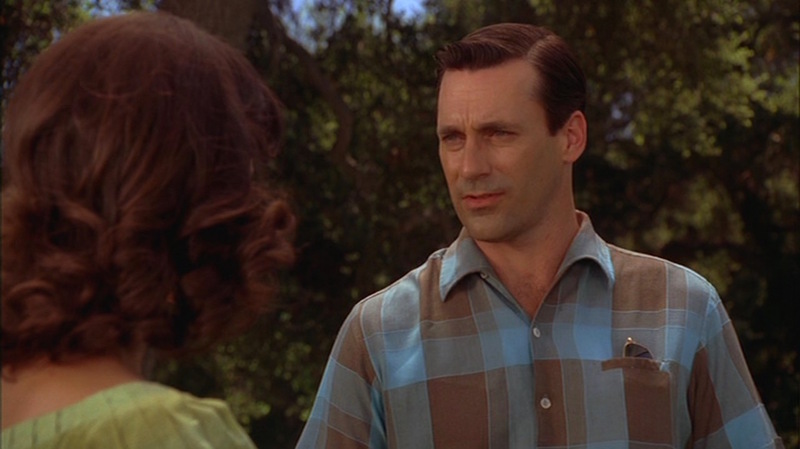 It may be easy for Suzanne to dismiss Don Draper’s choice of casual attire as yet another plaid short-sleeved shirt favored by the dads of the “Silent Generation”, but the ace work of Mad Men‘s costume designer Janie Bryant differentiates Don’s shirt from the pack. 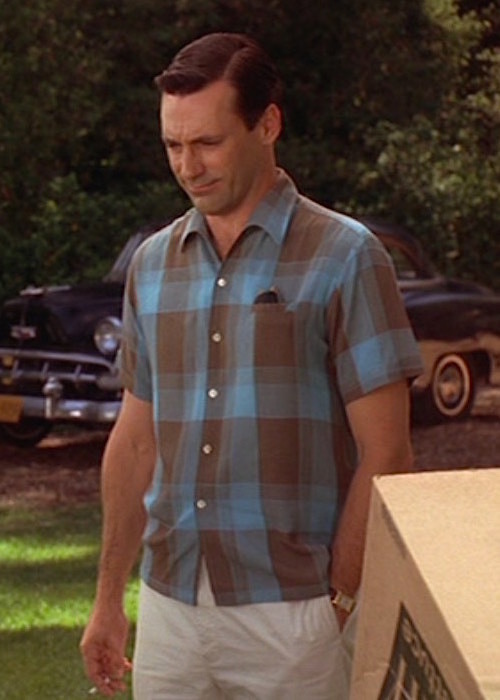 This is the most prominent appearance of Don’s brown and azure plaid cotton sport shirt with its curved one-piece collar that rolls over the non-functional top button on the right side. Aside from this relatively useless top button, there are five mother-of-pearl buttons down the plain front to the straight-hemmed bottom. Rather than the traditional patch pocket, the pocket on left side of Don’s chest is jetted for a cleaner look against the bold but organized plaid pattern of his shirt. The day is “hot as hell,” as Roger observed to Don in the elevator the previous morning, so Don forgoes his usual undershirt, which would also cause an unsightly white triangle in the space of his open-necked collar. There are double shoulder pleats on each side of the back for four total back pleats. The shirt’s short set-in sleeves extend halfway down each bicep with a fixed turned-up cuff that is sewn all the way around. 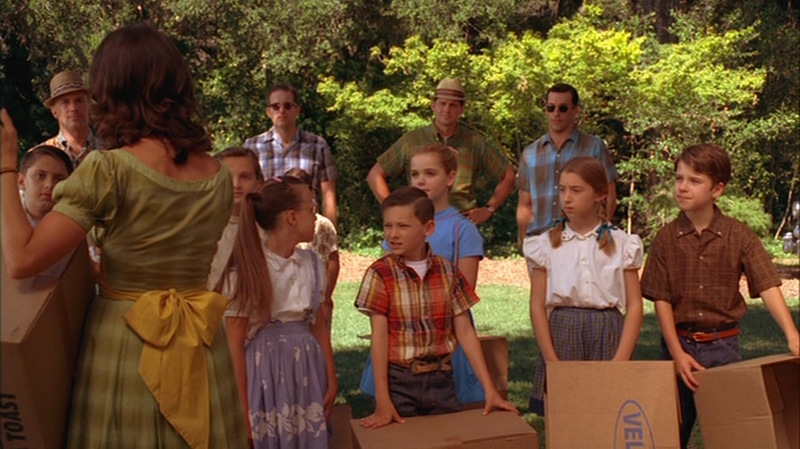 Suzanne and Don chat among the box-headed children (yes, that includes you, Carlton). With their military heritage, khaki chinos are a reasonable weekend trouser for a war veteran like Don. In “Seven Twenty Three”, he wears a loose-fitting pair of lighter cream-colored flat front chinos with slightly slanted side pockets, jetted back pockets, and plain-hemmed bottoms. Though the shirt is worn untucked, covering the waistband, Don reels back to get a look at Carlton’s camera obscura handiwork and gives viewers a glimpse of his dark brown leather belt with its shining brass buckle. 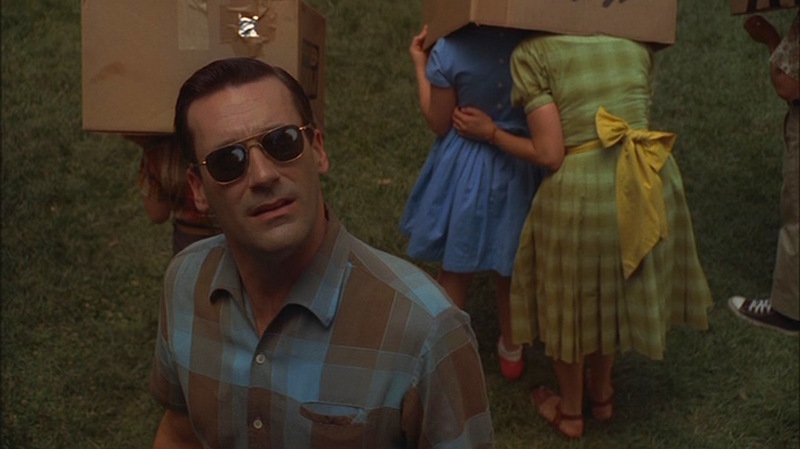 Don finds himself entertained by the students’ eclipse hijinks. Loafers are the ideal shoes for a casual outfit like this, and Don’s dark brown slip-ons both coordinate with his belt as well as the earth tones present in his shirt and chinos. The quick look at his footwear also reveals a dark pair of socks, though whether they’re brown or the less seasonal black isn’t clear. Don moves the conversation away from his daughter Sally after his “philandering” is called out by Suzanne. In the second and third seasons of Mad Men, Don Draper wore a yellow gold Jaeger-LeCoultre Reverso Classique luxury watch with a yellow gold squared case on a brown alligator strap. Interested in a Reverso? You could pay up to $50,000 – or more! – for a new one. 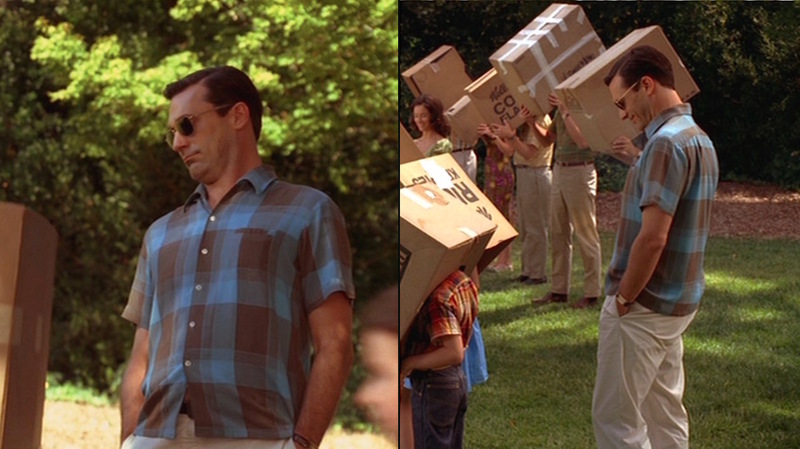 Don prefers a pair of sunglasses to a cardboard box on his head. Far more accessible are Don’s rugged square-framed sunglasses, confirmed by BAMF Style reader Preston Fassel to be the American Optical Flight Goggle 58 (FG-58), developed in 1958 to meet U.S. Air Force specifications right down to the “bayonet” temples designed to flex around the head while wearing a flight helmet. To read more about the correct identification and history of Don’s AO FG-58 aviators, check out Preston’s thoroughly researched (and thoroughly entertianing) article for 20/20 magazine and this article from Primer. 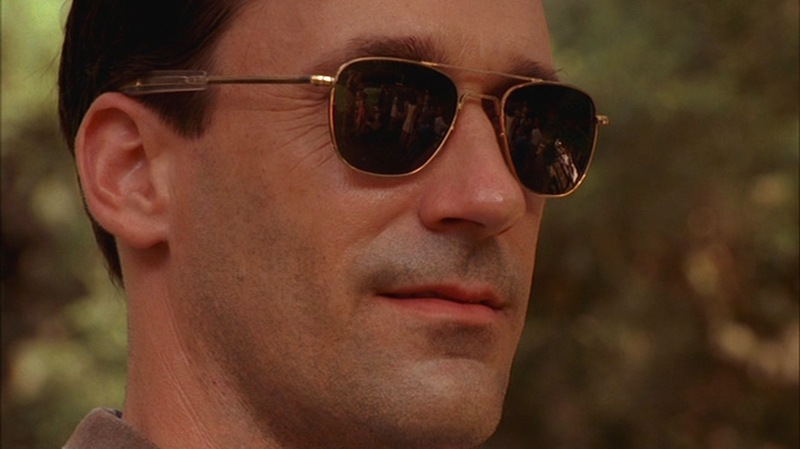 Don Draper’s Saturday: sunglasses, stubble, and satisfaction. Randolph Engineering, which was founded in the early ’70s and has been supplying handcrafted eyewear to the U.S. military since 1982, promotes the fact that Don’s sunglasses resemble their battle-tested RE Aviator in 23k yellow gold. You can pick up a pair of American Optical sunglasses on Amazon for less than $60, a fraction of the price of Randolph’s $180 pair. Don Draper may be wearing the uniform of a standard suburban dad, but his eye-catching duo-toned plaid shirt and simple yet elegant gold accessories separate him from the rest of the schlubs in the pack… as well as the fact that he looks like Jon Hamm. 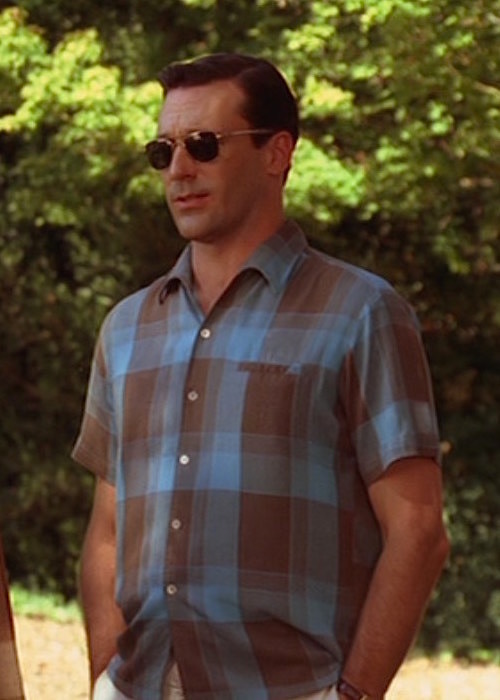 Don goes sans undershirt, as he does when briefly wearing the shirt again in a fourth season episode when chronicling his post-divorce progress. …don’t be one of the people Googling “my eyes hurt” today! Always wear proper eyewear if you plan on staring at the sun. Those RE Aviators may look badass, but there’s nothing badass about damaged retinas. Watch the entire series, but check out the third season if you want to see this episode. So how do people live… elsewhere? Thanks to my friend Dan for reminding me yesterday about this episode, just in time for me to acknowledge it with an Instagram post before the eclipse was first spotted over Oregon. Incidentally, Dan’s birthday was Sunday so please join me in wishing a happy belated birthday to the very helpful Dan! Don is in fact wearing a pair of American Optical Original Aviators, known in the 1960s as The American Optical Flight Goggle 58 (or FG-58). AO were (still are!) providers of sunglasses to the US Army as well as the space program– they were favored especially by pilots because the straight, bayonet temples were designed so that soldiers (and astronauts) could put them on without having to remove their helmets. (I own a pair myself and can attest to their comfort and versatility. I also encourage anyone interested to go check out the pair Sally Ride wore on her historic spaceflight, on display at Johnson Space Center in Houston). 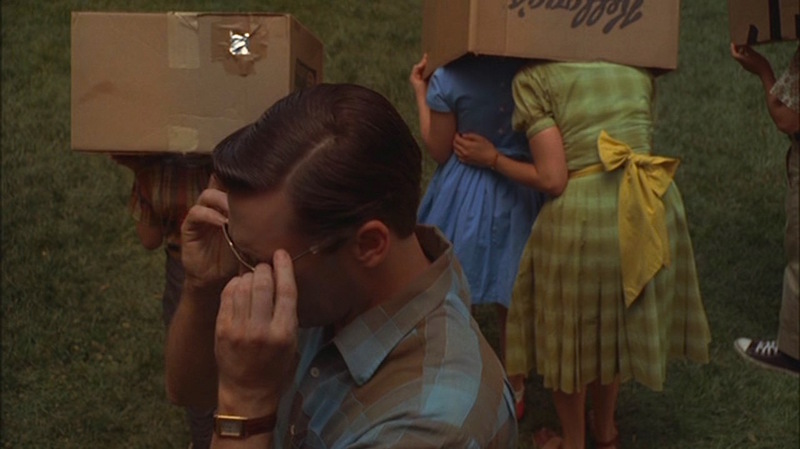 1) The actors (and DVD commentaries) have repeatedly noted Matthew Weiner’s obsessive attention to period-accurate detail. Since the Randolph model didn’t come out until 1982, it’s doubtful Weiner would’ve let that one slip. 2) The Randolph connection wasn’t made until some men’s fashion blogs and magazines began touting them as the Draper frame– often disparaging the AO Aviator in the same column. (I remember one fashion pundit going on a tirade how only “cheapskates” would buy AO and criticizing the fashion choices of anyone who would wear them!) The advertising of the RE frames in connection with MM seems to be borne more out of a desire to promote conspicuous consumption rather than concern with screen/historical accuracy. That is really interesting, Preston! Thanks for sending your very entertainingly written article and providing all of this research. This sent me off on a scurry of research, and I feel confident to confirm that it is indeed the American Optical FG-58 that we’re seeing on the show. That is a beautiful shirt. I particularly like the jetted breast pocket and the subtly curved collar, free from the fussiness of a button down. The colour combination of earthy brown and azure blue is impeccable. Have this exact pair of FG 58s, which I bought recently. Also had some issued pairs back in my service days. Very nice sunglasses and very reasonably priced. The khaki pants and camp shirt ensemble still works today. One of the classics. Great job. Great article. I have a couple of these vintage shirts in various patterns and colors. Except for one that is “woolnella”, I would say these shirts were a sturdy cotton blend, definitely not a summer weight cloth. The color style I have heard referred to as Italian roll collar or California roll collar. There is a loop under collar to close the top of the collar fully. A bit more complicated than the usual loop collar of that era. The labels on my shirts include Capwells, Towncraft Par Excellance (Penny’s, mid 60s), Mr Jack, and Sportsman of California, and a couple have an additional second label saying “single needle tailoring” with the size as well. Rare and tricky to find, I’ve seen a handful of these shirts over the years, not including the ones I’ve purchased. A tribute to Mid Century Style. If you look up a YouTube video of Gillian Hills singing Zou bisou bisou from 1962 (also a mad men tie in), you’ll see a man wearing one of these shirts but in a solid color. WOW! Thanks for the great insight and sharing your firsthand experience with these unique and attractive shirts. Would you be willing to share some photos here? I’d love to see some of these fantastic-sounding “single needle tailored” shirts! I wonder which “California roll” came first – the collar or the sushi! Hi, I would be happy to share some photos. Not sure how to upload them. I am in the process of a big move but snapped some shots just now a couple of those shirts and also have a few pics of similar shirts that I’ve seen online over the years. I misspoke about the 2nd label. It says size, “Washable”, and “R N 18286” with a needle and gold thread icon. I mixed that up with another “single needle” label on anther vintage shirt of mine. Always look before you post. I will include that label in a photo as well.